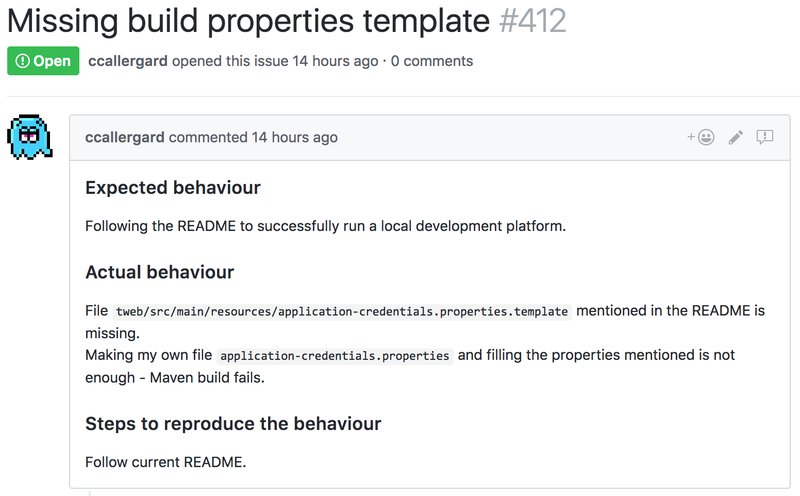 How to create an issue on GitHub? 1. Surf to the relevant project on GitHub. 2. Select the ‘issues’ tab. 3. Press the ‘New issue’ button. 4. Fill in the small form and press ‘Submit new issue’. The way you describe your issue is very important cause it can speed up the resolution time. As an example, look at the issue below, as you can imaging it will be much harder for a developer to resolve this issue based on the information that is provided. The following example on the other hand, clearly explains what is expected, what the current behaviour is and how a developer can reproduce the issue. Don’t be shy to add screenshots or even a video if it would help explain the issue at hand. Basically the more accurate the problem is described, the quicker a developer is able to understand the issue and start working on a solution. Of course you can also go overboard, leaving the developer discouraged behind his desk. They key is to pass all the required essentials and no more. If you do feel that you need to proved all the information, then it might mean you have to split your issue into multiple smaller ones.